If you had asked me what publication most likely to do a story for next, it would not have been Vogue. 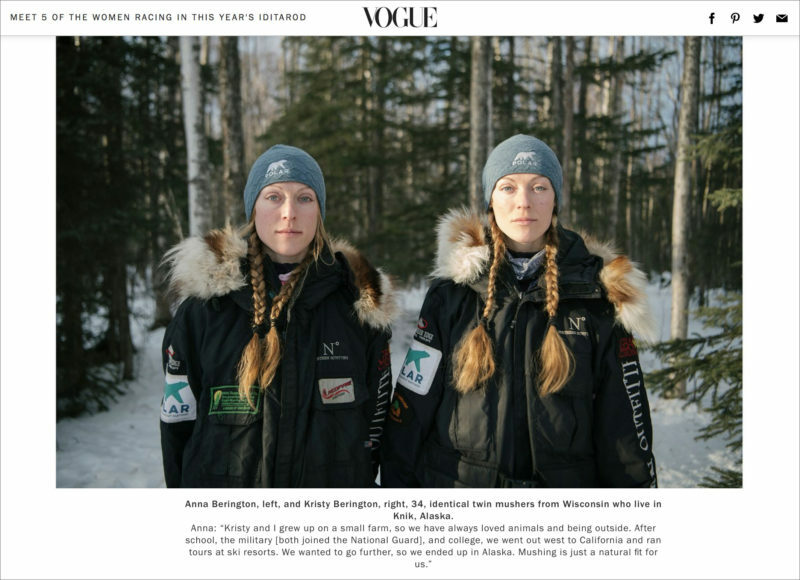 But sure enough, in December, Vogue got in touch about a story involving dogsledding, Alaska, and the most incredible group of women mushers. Although it did take a bit of convincing that I was the appropriate photographer given that I’m not a woman, conceptually I was onboard right away. It turned out to be a good fit– I relied a great deal upon my experience shooting in the Arctic. I hung off of sleds sideways, rode snow machines while piloting drones, and battled the sleet and snow constantly obscuring my lenses and viewfinders. The first woman to win the Iditarod was Libby Riddles, in 1985. While other teams waited out bad weather, she left the safety of the checkpoint at Shaktoolik to mush into a blizzard on the frozen Norton Sound. By the time the weather cleared, she had the advantage. It was a terrific experience thanks to the art direction and production from Emily Rosser and Nikki Krecciki, as well the hospitality of these talented mushers who invited me into their lives. Thank you Alison, Kristy, Blair, Alison, Magda and Jessica! Additional thanks to double threat Blair Braverman, who is not only a musher, but also an incredible writer.